Her Name Is Sylvia: LAST MONTH OF PREGNANCY MUST HAVES & UPDATE. LAST MONTH OF PREGNANCY MUST HAVES & UPDATE. Its been a little bit of time since I posted. A lot has been going on as I am approaching my due date and now I have a lot more time on my hands as I am 39 weeks and my due date is approaching fast. I'm definitely in my nesting phase. I have been feeling so tired the last couple of days and not wanting to do anything! Lots of lounging on the couch, surfing the web and reading up on baby things, which is not like me at all! I always feel like I need to keep busy doing something but I am not fighting it. Everyone says that you should relax and reserve your enjoy for labor and for when the baby comes. This whole pregnancy I have really felt great and have had a wonderful easy pregnancy. This last month has been the hardest of all as my body is so achey, sleep deprived & experiencing lots of cramping in preparation for labor. 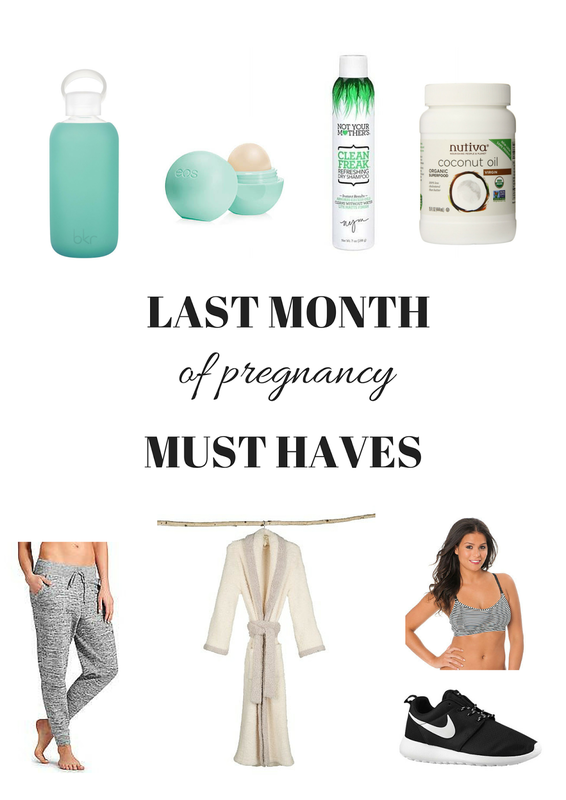 So this post is dedicated to my must haves for my last month of pregnancy. All the things I really enjoyed having or needed to get me through the days and nights. 1. Water Bottle - Water is key during pregnancy - keeping hydrated. I just keep filling up my water bottle and drinking all day long. Its routine to me by now and I bring it with me everywhere I go . This BKR bottle comes in different colors and is convenient so you can through it in a bag with you on the go. 2. EOS Chapstick - I suppose it's because of winter or maybe a change in hormones but I hate when my lips are chapped! - I love EOS Chapstick to keep my lips feeling nice and smooth. 3. Not Your Mothers Dry Shampoo - I have really fine hair so its necessary for me to wash my hair everyday if I want it to look good. For the days the I don't feel like doing my hair this dry shampoo is a life saver. Not your mothers is my favorite dry shampoo that I have used and I have been using it for a few years now - unlike the rest I find that It doesn't leave my hair looking powdery. 4. Coconut Oil - Throughout my pregnancy I was using all sorts of belly butters and oils to help with my itchy skin and to help with stretch marks. As time went by in my pregnancy my skin also changed getting more sensitive to the butters and oils I was using. I had to switch and start using coconut oil which is a good natural way to help with stretch marks and your itchy growing belly bump. 5. Athleta Jogger Pants - Chris bought me a few things from Athleta for christmas and I absolutely fell in love with everything! The perfect lounge clothes. These Jogger pants are a must have for me. They are so comfy and I love just throwing them on to run a couple errands or to lounge around the house in. These aren't Maternity but they perfect in my regular size that I would be pre maternity. 6. Barefoot Dreams Robe - Ok if you don't know about barefoot dreams you are seriously missing out. The last few months I was hearing so much about barefoot dreams and how amazing it was. I finally discovered what this so called barefoot dreams was and I am HOOKED! It is seriously the most comfortable thing I have ever worn. I have a regular robe and I seriously wear it around my house all day long. It's the perfect robe to lounge around in and keep warm in the winter months. 7. Motherhood Maternity Sports Bra - For days that I am running around or lounging in the house I like to just dress comfy. I picked up a bunch of nursing bras from motherhood maternity and this one I have been wearing already. It is very comfy and I also love that it comes in black and white stripes. 8. Nike Roshe Runs - Last month of pregnancy I have been getting pretty tired easily and my feet have been really hurting especially when I am out running errands. I still like dressing up and looking put together but sometimes my feet can't really handle wearing boots. I wanted to get a pair of sneakers that I was able to wear while I am dressed up for running around. I love these black and white Roshe Runs these are stylish and are extremely comfortable.